Plants in the workplace have some incredible benefits! From cleaning the air to increasing productivity and reducing stress – there are so many reasons to get indoor plants for your office. But knowing where to start can be hard. There are so many different types of indoor plants and for a serial plant killer, knowing which plants to get for your office can be daunting. Even when they’re indoors, you need to make sure you’re getting the right plants for your climate. And in Brisbane that means you need something that’s not only resilient to heat, sunlight and all that air conditioning but that will thrive in those conditions. We’ve put together our top 6 indoor plants for Brisbane so that when it comes time to purchase, you’ll know exactly what to look for. Sometimes referred to as a “ZZ”, the Zanzibar Gem is a tough little plant that is one of the best indoor plants for beginners. You can tell the Zanzibar Gem from it’s shiny and waxy leaves – which means that it’s going to retain water and can deal with some direct sunlight. Don’t keep the Zanzibar Gem directly in the sun but a well-lit spot is best. Water only when the soil is feeling dry – it won’t do well when over-watered. As its name suggests, the Happy Plant will brighten any corner of your office. With the ability to get a bit more height than other indoor plants, the Happy Plant can make the perfect centerpiece for a waiting room or liven up a stale board room. This plant only needs to be watered occasionally when its soil is dry, and is adaptable in many areas – from a well-lit position to somewhere with very little natural light, or even in an outdoor covered area. 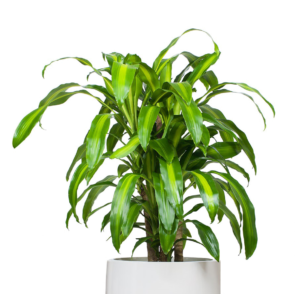 If you’re looking for something that’s a bit more colourful and will add a hint of decoration to your office, look no further than the Chinese Evergreen. A popular indoor plant in Brisbane, there are a number of colour varieties from silver to dark green and even red! 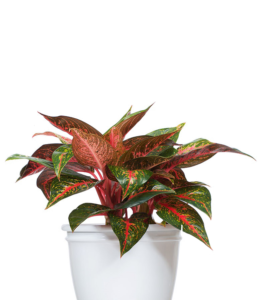 With large glossy leaves, the Chinese Evergreen can also go for long periods without watering and doesn’t like to be too moist. Keep them out of direct sunlight and they’ll be happy anywhere! 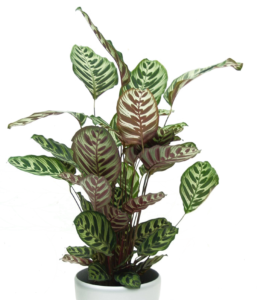 Thriving in low light, a Calathea plant is perfect for those offices with limited natural light. However they can be sensitive to cold air, so if you keep them away from the air conditioner’s path they’ll thank you for it. Corners with a limited draft or in an area that gets a bit humid will be perfect for your Calathea plant. Nothing says tropical Queensland like a palm – bring the outdoor summer into your office with the Parlour Palm. 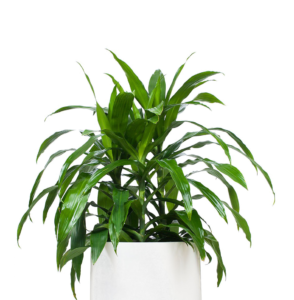 Great for beginners, this indoor plant resembles a palm but is just a smaller and daintier version. Often found together with a few palms in the same pot, they can add a pop that other indoor plants can’t quite manage. 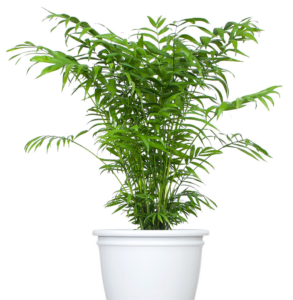 The Parlour Palm is also one of the top indoor plants for air purification so you’ll be glad they come as a cluster! They’re not a fast grower – but that doesn’t mean that they’re not loving it in a corner away from direct sunlight with occasional watering. This sub-tropical woody plant is a part of the lily family and is often described as ‘tree-like’. 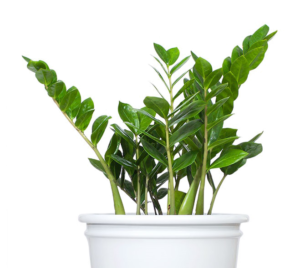 Another great indoor plant for beginners, your Janet Craig will thrive in a brightly lit place near a window, without needing to be watered too often. And if that’s not good enough, the Janet Craig also made NASA’s list of top air-filtering plants – which can fight common office ailments like headaches, eye irritations and allergies. If you’re ready to get started with some new indoor plants to brighten up your office, check out the Beginners Guide to Indoor Plants. We know the climate and the challenges your indoor plants will face. That’s why we stock all of the best indoor plants for Brisbane to hire and maintain. So you can get all the benefits without the work! Get in touch with the friendly team at Prestigious Plantscapes and we’ll take care of your indoor plants and all their needs.